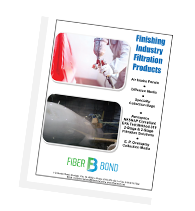 Fiber Bond produces top quality finishing industry filtration products. Whether it’s intake panels, diffusion media, overspray collection media, specialty collection bags or NESHAP compliant products, you can be assured that you are purchasing top-of-the-line filtration. Download the brochure for a brief overview of the finishing filtration products line.